(L to R) Founders of Casamigos Tequila Mike Meldman, George Clooney and Rande Gerber attend the launch of Casamigos Tequila at Ushuaia Beach Hotel Ibiza on August 23, 2015 in Ibiza, Spain. George Clooney is selling his tequila company Casamigos to Diageo for as much as $1 billion, a source familiar with the situation told CNBC. 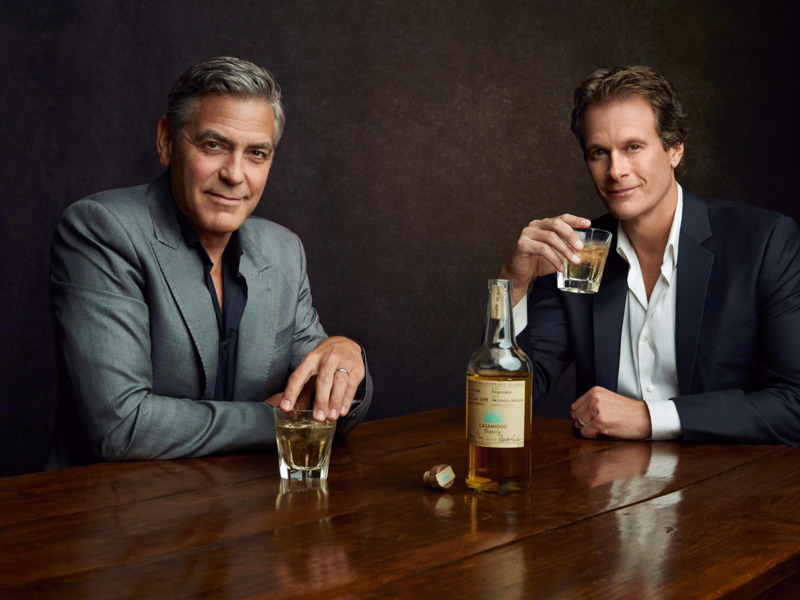 Clooney, Rande Gerber and Michael Meldman, who own Casamigos together, are expected to stay with the company after its acquisition. Gerber founded nightlife companies Midnight Oil and the Gerber Group and Meldman is a real estate tycoon. Casamigos, which loosely translates to "house of friends," started as a private collection of tequilas meant just for Gerber and Clooney's friends and family. However, in 2013, the team brought the label public when they had to get licensed to continue making the tequila. "It immediately took off," Gerber told CNBC back in November. "Right now, we're the fastest growing ultra-premium tequila in the country." George Clooney is saying adios to Casamigos. The 56-year-old actor just sold his tequlia company to British spirits seller Diageo for a cool $1 billion, Deadline reports. Clooney, who owns the booze brand with Rande Gerber and Michael Meldman, is reportedly staying with the company after it’s purchased. “If you asked us four years ago if we had a billion dollar company, I don’t think we would have said yes,” Clooney told Deadline. Casamigos, which loosely translates to “house of friends," started up four years ago as a private collection between Gerber and Clooney’s friends and family. The label went public in 2013 when the team had to get a license to continue making tequila. George Clooney created a tequila company on a whim and now it's being sold for $1 billion, CNBC is reporting. The idea behind Casamigos, the brainchild of Clooney and his two friends, Rande Gerber (Cindy Crawford's husband), and Michael Meldman, was born when Clooney and Gerber bought neighboring properties in Mexico and got into drinking tequila. They got so into the drink they decided to create their own, Clooney told CNBC. "Our idea was to make the best-tasting, smoothest tequila whose taste didn’t have to be covered up with salt or lime," the founders claim on their Facebook page. Initially, the spirit was only made for their own consumption but after two years the distillery said that they had ordered so many "samples" that they would now need to have the drink licensed. In 2013, they launched the company and made the drink available to the public. It became one of the fastest-growing tequila brands. Well, he certainly meant it when he said it had been his biggest earner ever! Hmmm well this is very interesting. So tho the guys are selling they are still going to be very much involved with Casamigos? Wonder what that means? It means they're now very high-priced employees of Diageo. Way2Old4Dis wrote: It means they're now very high-priced employees of Diageo. Im disappointed they are selling. But they have their reasons. I'm wondering if the business was getting bigger than they could handle efficiently? Rande and George staying on to promote and advise hopefully will ensure that the quality of their product won't be diminished. If their names are staying on the label then I would think they are very much invested in making sure the quality doesn't change. Rande and/or George have stayed pretty "hands-on" with Casamigos. Rande has said they taste every batch personally. Amal will have it spent in 6 months. Depends on the pre-nup! And don't they have a 3rd partner? In any event, if you read the deal it is not for $1 billion. It is $700 million with the possibility of more over 10 years depending on the performance of the tequila. But yeah, a hell of a lot. Who knew the liquor business was worth this much for what must essentially be a niche brand (1 type of liquor at a higher price point)? Mike Meldman is their partner at Casamigos. I'm assuming the $700 million will be split three ways. One article I read said George was getting $233 million. Yep it was split three ways George is the big name so of course they ignore the others. has a family to protect. Many unpleasant greedy people out there. I read that Diageo bought another tequila brand (Jose Cuervo). I wonder if they spent as much for that as for CasaMigos. Maybe they're trying to corner the market on premium tequila brands. Jo, as far as security is concerned I think they're pretty safe for now considering they're hunkered down in Sonning. I'm sure they've got plenty of security - maybe even more than usual now that the twins are there. I'd be more worried about the Gerber kids since they're older and out in the world more, which leaves them more exposed. Don't forget the tax man takes its cut from this too. Not that they'll be starving trying to live of the $100 million or so that they'll each get, but it's not quite the 1 billion touted in the press! [url=https://twitter.com/intent/tweet?url=http%3A%2F%2Fwww.forbes.com%2Fsites%2Ftaranurin%2F2017%2F06%2F22%2Finvestors-doubt-george-clooneys-tequila-is-worth-its-1-billion-offer%2F&text=The stars must line up perfectly for this deal to create value%2C in our opinion. ]“The stars must line up perfectly for this deal to create value, in our opinion,”[/url] writes Morningstar analyst Philip Gorham, who estimates the valuation lower Morgan Stanley at 11.5 times 2017 sales. George Clooney won't have to worry about a college fund for his newborn twins. The Oscar winner just sold his tequila business with partners Rande Gerber and Michael Meldman to British company Diageo for $1 billion, ABC News has confirmed. "If you asked us four years ago if we had a billion-dollar company, I don’t think we would have said yes," Clooney said in a statement Wednesday. "This reflects Diageo’s belief in our company and our belief in Diageo." Gerber described himself, Clooney and Meldman as "kind of shocked" by the sale. "I guess we were kind of shocked because never planned on starting a tequila company. We made Casamigos just for us to drink," Gerber said today on "Good Morning America" by phone from Mexico. "Four years later when, you know, we’re offered a billion dollars to sell the company, yeah, we were kind of shocked." CNBC first reported on the deal, in which Diageo will pay an initial $700 million, with the potential for another $300 million over 10 years based on the tequila's performance. Diageo was lauding the deal on Twitter. Clooney made it clear that although he and his partners sold the company, they will still be involved, saying in his statement, "We’ll still be very much a part of Casamigos." Gerber, who is married to supermodel Cindy Crawford, echoed Clooney's statement and described the Casamigos brand as "a lifestyle" for its founders. "I think the most important thing for us though was we really love what we do and we love what we made and want to keep drinking it and keep the team together," he said. "Fortunately we get to keep our team together and we’ll continue to run the company and stay involved." The three friends started the company, which translates to "house of friends," as a private collection of tequilas meant just for their friends and family. But in 2013, they took the company public. "It is pretty shocking what we created in four years," Gerber said on "GMA," adding they will "definitely not" change any of their tequila recipes. After the sale, Clooney was lauded for his good fortune. Actor and director Albert Brooks joked on Twitter that "it's great when someone like that can catch a break." Of course Casamigos objective value isn't $1 billion, that's what others (Diageo) are willing to pay for it. That's how capitalism works! Or does anybody really think that companies like Apple and especially (whose most valuable asset are the users datas)? I'm still surprised that Diageo think that $1bn is a good investment for Casamigos. Do they even have the production capacity to make so much tequila to sell so Diageo can make their money back? Diageo wants to expand Casamigos' reach worldwide so I would guess that they factored that into their justification for a $1 billion price tag. They seem to be really successful with their other brands, including CIROC vodka, which is marketed and promoted by Sean Diddy Combs. I guess Diageo is looking for similar success using George and Rande as promoters as well. There are many reasons for buying a competing brand - and also many reasons for selling it. To alleviate the cash from a whole entire nation"
Have it like an oligarch"
According to Time magazine, many drinks lost their appeal over the last year and percentages are down, and that includes wines and beer. Tequila is about to become harder to produce, and therefore harder to buy. Agave plant growth has not kept pace with its uses in several new markets, and the plants take about eight years to mature. But guess who has control or deals with the top agave producers? That's right. Diageo. They will make their tequilas while others scramble to keep up. Tequila is more popular than ever, and now with it becoming a premium commodity, people will pay higher prices for the good stuff. Looks like George and his partners will get the full billion off this deal. For George, more money to give away, probably.